It's one of my favourite races this weekend - the Japanese Grand Prix at Suzuka. It's a great country and an even greater race track, one of the best in the world. Suzuka is a historic circuit. We have seen the greats drive here, so it holds a different value than a new circuit that doesn't have that history. The old circuits were built differently. It is a looping circuit, with a figure-of-eight layout and the first sector, in particular, is just great. All the drivers love it. On top of that, Suzuka still has a danger element to it - it doesn't have the massive asphalt run-off areas that we see at many circuits these days. We saw that danger in the most tragic way last year when Jules Bianchi crashed, and returning here for the first time since his terrible accident, he will obviously be in our thoughts. It looks like it is going to be wet for at least part of the weekend, certainly on Friday, just as it was in the race last year, and that brings its own special challenges, whether it's Suzuka or not. The two key things are that visibility is much reduced, and the car is much more on a knife-edge than in the dry. When you're driving, you are normally looking really far ahead. But in the wet, you can't see a lot at the best of times and if you are behind a car, it is like you are driving through thick fog. The corners appear quite quickly and you have to react. On top of that, you have to be so much sharper, so much more alert than you do in the dry. It is a bit like driving on ice - the acceleration and braking have to be more progressive and the car is more unpredictable. When it goes, it goes massively quicker than in the dry. Sometimes it happens - you aquaplane or whatever - and it goes so fast that there is nothing you can do to catch it, even though F1 drivers have such quick reactions. So when you are driving, your foot is constantly hovering over the brake, always alert for that possibility, way more than in the dry because in the dry you know you're not going to have to put up with that massive snap. That all means your heart is racing more, and you are more intensely focused. So a race in the wet is mentally much more draining than the same track in the dry. Then there is the fact the actual driving is also much less rigid and predictable than in the dry. I grew up driving in the rain at places all over the UK so it was always part of my upbringing and somewhere I had to be very strong. I won a lot in the wet as a kid and I'm pretty sure in F1, more often than not, I have been in the front when it's wet. As a kid, you learn that different lines work in the wet because the way the water runs over the circuit means some parts have more grip than others. I watched a re-run of last year's race on Wednesday and seeing the different lines people take was great. It is a track where you have to be very adaptive and there is a dynamic racing line, it is shifting every lap - which is awesome. I like driving in the wet because it is a challenge. It spices it up. And the best thing about it is it is constantly changing. That is something that carries over into the rest of my life. I don't like routine. I like change and spontaneity. That's why I travel as much as I do. One of the best things about F1 is that every year you arrive and the car is different and you are studying something new every year. Then through the year it shifts as well. I love going to new hotels, meeting different people. I love that it's not the same every day. Sometimes I like being at home. At the end of the season, there is a point where I'm like: "I don't want any more spontaneity right this second." You get your peace and quiet and then towards the end of that I am like: "I can't wait to get back to moving about." That's why I like winter in Colorado. I live in an apartment in Monaco, which is homey, but the place in the mountains feels like my actual real home. It is the one house I own and have had built for me, and it feels like my family home. That's where my kids are going to grow up. Although it's my winter place, it's my favourite place in the world. We had a bad weekend in Singapore - we were off the pace all weekend and then I had to retire from the race - and since then my Mercedes team have done a lot of work to try to understand what happened. After every weekend there is constant analysis of bits that are on the car, checking for failures and all sorts of things. A lot of work has gone in to try to understand why we had the failure we did. As soon as they discovered that they tried redesigning the part, and then tested it to make sure it's durable and we now have that upgrade on the car. In terms of our pace, the aerodynamics department, those on the mechanical side and also the tyre people have been trying to understand why we weren't working our tyres the way the others were. And it's still ongoing. You don't just work it out in a couple of days. We feel good about the analysis we have done. We are in a much better position than we were on Sunday night in terms of understanding it and that we're not at a loss. The main thing is that we are pretty sure it was specific to Singapore. Looking back, that was probably, in relative terms, our weakest race last year, too, in that the others closed up on us there. That is evident now and changes will be made for the future. We already have a plan in terms of what we would do next year when we go there, now we've realised that is a problem. Coming to Japan, we will approach it exactly the same as any other race. We are hoping we don't see what we saw in Singapore and that it's just that one track. But you can't dwell on it, you just have to do the best you can. That is what I will be trying to do this weekend, and hopefully this time it means being at the front again. You can follow Hamilton on Twitter @lewishamilton and you see exclusive content on his website www.lewishamilton.com. 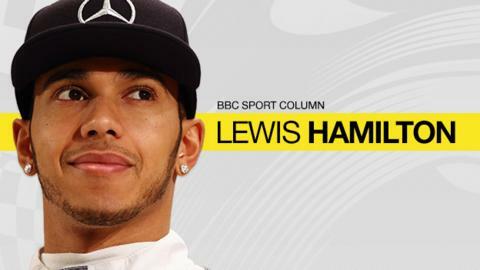 Lewis Hamilton was talking to BBC Sport's Andrew Benson.